Put a little haunt in your Halloween—join the host of A&E’s 2-Night Special Extreme Paranormal, members of a paranormal team regularly featured on the Maury Show and others as they share “The Secret Life of Ghosts”–and pick up a copy of Skeletons in the Swimmin’ Hole, which will be publicly available for the very first time at the event! The event raises funds for the repair of St. Peter’s Masonic Lodge in New Milford, Connecticut, on October 15. Haunted Disney Tales will make a donation to the Lodge for each copy of Skeletons sold. Nathan Schoonover, occult specialist for the A&E 2-Night Special Extreme Paranormal and co-host of the popular Internet Radio Broadcast The Ghostman & Demon Hunter Show, plans on first giving the public a glimpse into the making of a paranormal reality TV Show before moving on to share his most terrifying experiences. “I want to cover not just the technical side, but the spooky side of paranormal investigating—the scary stuff,” Schoonover said. The following will present plenty of EVPs [Electronic Voice Phenomenon—ghostly voices captured on tape] and evidence from recent cases: Andy Seidel and Donna Parish-Bischoff, of the Maury Show-featured East Coast S.C.A.R.E. Society; Carrie Kerns and Mike Mafera of Connecticut Paranormal and Encounters Research (CPEAR); and Orlando Ferrante and Joe Franke of the Connecticut Paranormal Research Society. 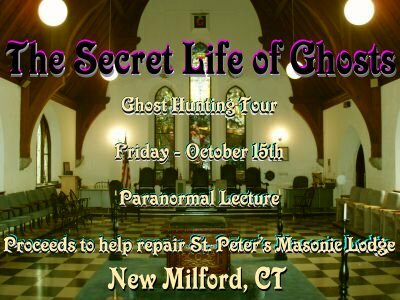 The event will be held Friday, October 15, 2010 from 7:30 p.m. – 10:30 p.m. at St. Peter’s 21 Masonic Lodge, 11 Aspetuck Avenue, New Milford, CT. Admission is $5 and all proceeds will benefit the repair fund for St. Peter’s Masonic Lodge. For more information on the event or its participants, visit http://www.ghostanddemon.info/ghost_tour.